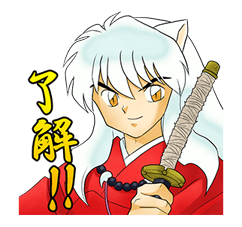 http://www.line-stickers.com/ – INUYASHA Line Sticker | Half human, half-demon, 100% awesome! Inuyasha, the dramatic story of the trials and tribulations of Inuyasha and friends, is now featured in LINE stickers! Get a total of 40 versatile stickers perfect for all sorts of situations! Previous post He-ey, this is Maria Way! Rich Man & Rich Woman. Applause, please!